This page presents an interface to a Bluetooth headset for Amateur radio application. The key advantage in my solution is that the Bluetooth headset's answer/hang up push-button can be used to control the radio PTT. This is very convenient inside and around the shack. The enforcement of city and provincial/state by-laws force the hams to use a hands-free microphone as replacement to the classic hand mike. In addition, here is the Jabra A210 interface instruction manual. I recommend that you consult the above links before continuing on. 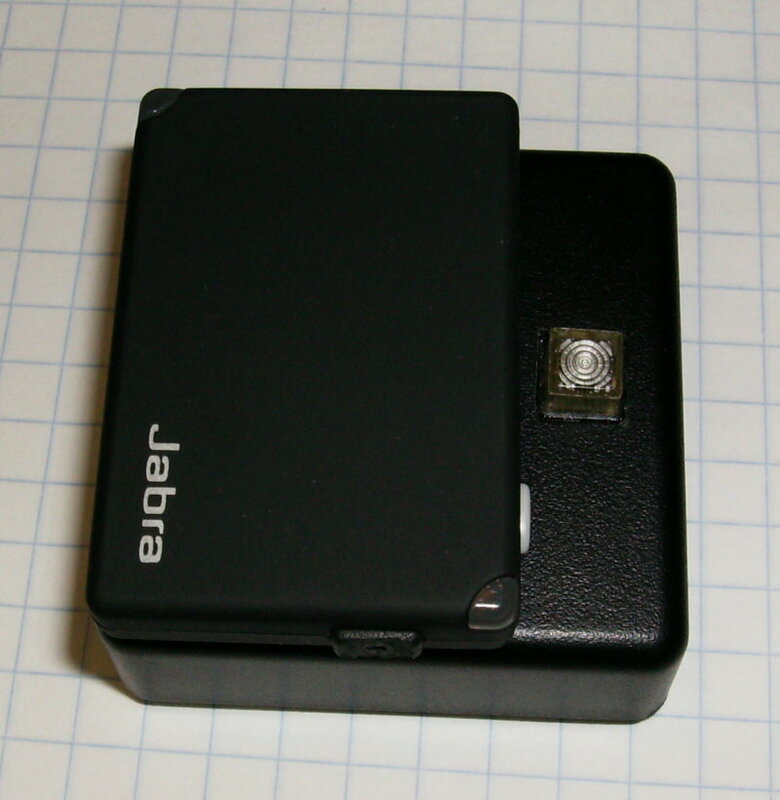 There is one feature in the Jabra A210 device that is not documented anywhere and that has not been proposed by anyone so far for PTT support. It is the ability for the A210 to pick up a cell phone call or hang up using the Bluetooth handset push-button. I have discovered this after analyzing the literature on wired headsets and on the A210 itself. With proper interfacing, this feature can be used for wireless PTT support. In a nutshell, the A210 sends a 400-millisecond short to ground on the phone plug tip every time the headset push-button is depressed. This cannot be sensed or perceived unless a weak pull-up resistor is populated on that signal. In order for this feature to be used for PTT support, a D-Type Flip-Flop function must be added. Pressing once engages the PTT, pressing again dis-engages the PTT, and so on. I have decided to implement this function in a PIC micro-controller. The PIC12F683 is a low cost 8-pin device; this is smaller than the 14-pin MC4013 dual D-Flip-Flop chip. I also use an analog function of the PIC, its comparator input, for better noise immunity and less loading on the audio line. I have also added a timeout timer that will release the PTT if it is engaged for more than 2.5 minutes. This could prove useful if the bluetooth link is lost. Since a 12V DC source is provided in a mobile application, I have added a +3.7 V DC voltage regulation that will work with anything higher than +7 V DC. 02/02/2010 - Added notes specific to West Carleton Amateur Radio Club group project. Others may disregard. 10/01/2010 - R5 value changed to 100K ohms. R7 and R8 value changed to 10 ohms (easier to procure). Schematic diagram (version 2) and parts list updated accordingly. PIC firmware updated to version 2. A few assembly notes added. 10/01/2010 - R3 and R4 had their value swapped on the schematic and on the parts table. The PCB view and PDF files have been updated. 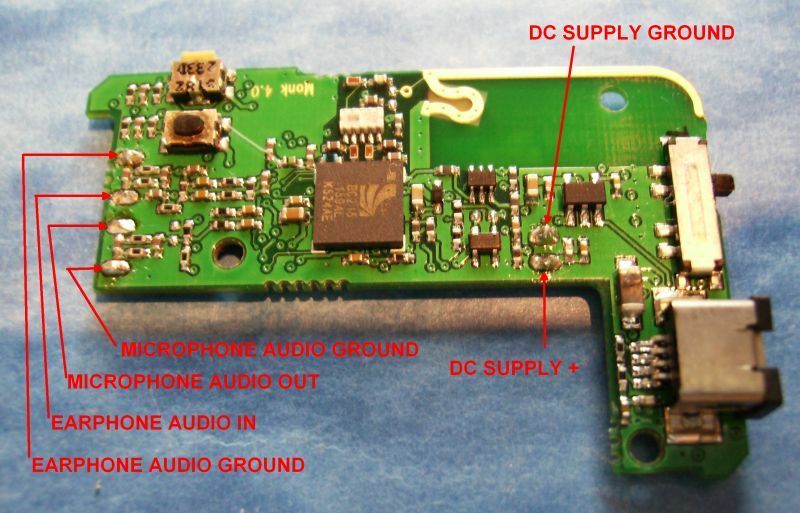 My Jabra A210 - Radio interface schematic is shown on the right hand side. The circuit is quite straightforward. The headset microphone audio signal flows from left to right, from the Jabra A210 to the radio microphone input. A coupling capacitor C1 is added to eliminate possible DC contention on that line. The headset earphone audio flows from right to left, so from the radio speaker to the A210 earphone input. I have populated an optional attenuator made of R3 and R4 to reduce the audio level going into the A210. Note that the speaker ground and the headset microphone ground are kept separate. 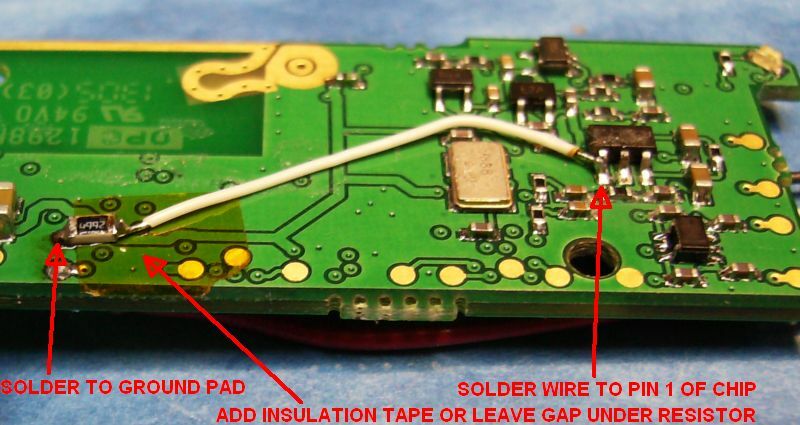 Inside the Jabra A210, there are separate pads on the PCB. This is to keep any ground loop (hum) to minimum. The pull up resistor that allows to produce the pulse to ground is R5. The pulse is detected by the PIC micro-controller through R2. A wired PTT push-button provides a local PTT function identical to the headset push-button. The PTT output sent to the radio is provided by Q1, an NPN open collector transistor. When the PTT is active, the transistor shorts the radio PTT line to ground. There is also an optional PTT LED line provided for visual acknowledgment of the PTT state. I have created a PCB layout that custom-fits a Hammond 1551RBK enclosure. This is a neat and compact solution. The PCB layout is shown on the picture to the right. The PCB is made of single-sided copper clad glass-epoxy material of 0.062" thickness. The copper pattern resides on the PCB bottom side. The components are located on the top side. When hand-making the PCB, drilling of holes is required to solder the components to the copper pattern. If you wish to make this PCB yourself, here is the PCB copper layout file. It prints on letter-size paper. When printing in full size (no scaling) the dimensions and proportions should be accurate. I wrote the PIC12F683 firmware in ANSI C. I used BoostC and the BoostIDE environment. These are free compiler and integrated design environment available from SourceBoost Technologies. The code is commented so that you can understand what is happening. Have a look at the .c file. Here is the whole design directory. Some preparation is required in order to use the Jabra A210 Bluetooth interface in my application. Open up the unit. This is a delicate task if you want to preserve the looks of your A210. Using a sharp knife, carefully crack open the casing. It is easier to start on the side where the casing has a long recessed slot. Work your way to the corners and the ends. Go gentle. The glue should give pretty easily. Watch out for the flying white button! Work over a table and make sure to recover the white button that falls off when you spread the two covers. Remove the old battery. If you intend to connect the unit to the voltage regulator for external battery operation or 12V DC, you must disconnect and remove the old battery. Simply cut off or desolder the battery wires. There is hot-melt glue on the contacts so take that off first. The battery is also glued to the casing; use a small flat screwdriver and gently pull it off. Remove the coiled signal cable. Simply desolder or cut off the four wires attached to the PCB. There is hot-melt glue on the contacts and wires so take that off first. Preserve the rubber grommet to plug the cable hole after completion. Simply cut off the cable from the grommet with a sharp knife. Implement VE3LC's modification. The A210 normally transitions to a power-saver mode after 60 seconds without any audio fed into it. For an amateur radio application, we do not want this. To keep it alive, install a 47K resistor as shown on either of the pictures to the right. I recommend using a surface-mounted resistor. I used an 0805-size resistor and some AWG-30 "wire-wrap" wire. Implement the solution you are more comfortable with. In either case, the result is a 47K resistor connected between pin one of that chip and ground. If you are still unwilling to deal with surface-mounted components, implement VE3LC's mod using a regular leaded resistor as shown in his PowerPoint presentation. Attach new wiring. Desolder any old pieces of wire from the PCB and connect new wires to the six PCB pads shown on the picture to the right. Use long enough wires to allow interconnecting with the interface PCB inside the Hammond box. Using colored wires is a good idea. Drill a hole in the A210 to feed the wires to the Hammond enclosure. You want to send all the wiring to the Hammond enclosure located underneath. Drill a hole through the bottom cover that is big enough to accommodate all the new wires. The best location is somewhere in the center of the area where the battery used to be located. Assemble the interface PCB as per the parts list provided below. I highly recommend using an i.c. socket in the PIC micro-controller location. The PCB is quite small, so I had to keep the pad size to minimum. This makes re-work (replacing components) difficult without damaging the pads and traces. Make sure that the components are in the right locations before soldering! Depending on the electrolytic capacitor package used in C2, it may or may not fit in the proposed enclosure when mounted vertically. Install C2 last and bend its leads 90 degrees to mount it horizontally (parallel to the PCB surface), and above the other components. 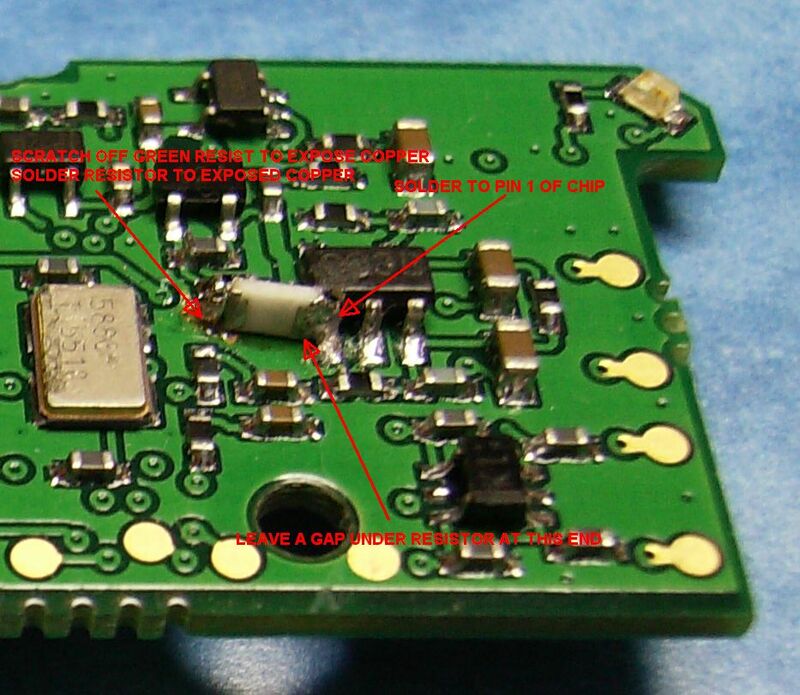 Install the PIC micro into its socket only after the entire soldering process is completed. Install the momentary PTT push-button and the PTT LED (optional) on the top face at one extremity of the Hammond enclosure. 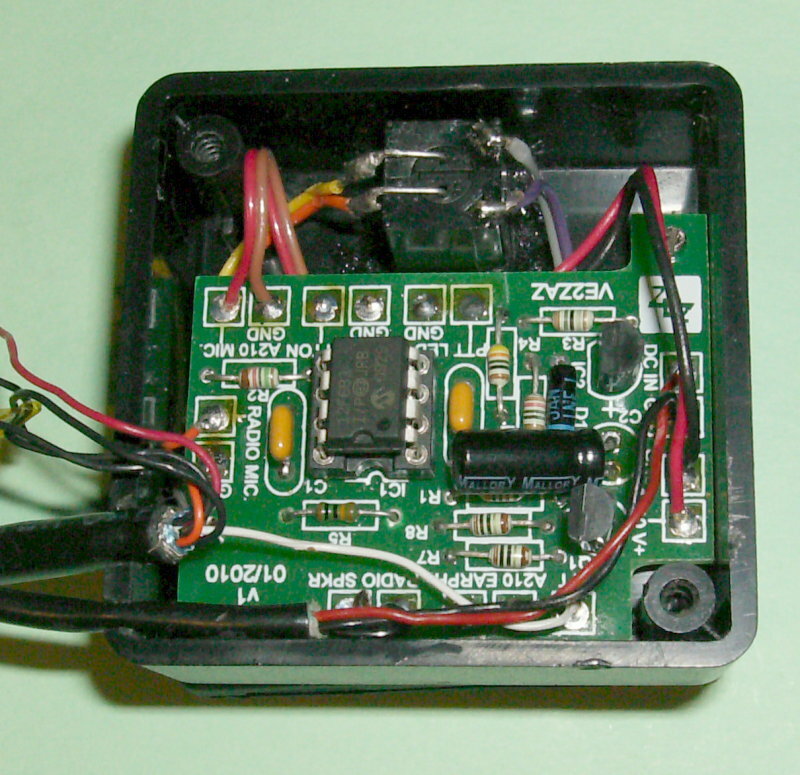 Make sure that the PCB will still fit inside the enclosure with the proposed push-button and LED locations. See the picture to the right for the proposed location. Note that I used a push-button with built-in LED. Drill a hole to feed the wires from the A210 inside the enclosure. You want this hole to be located on the top face of the enclosure, underneath the interface PCB. Position that hole to align with the hole on the bottom cover of the A210 so that the A210 is neatly positioned on top of the enclosure. Use the A210 bottom cover to mark the location on the enclosure for an exact hole line up. Once again see the picture on the right hand side for a suggested A210 location. Drill a hole on one side of the Hammond enclosure to feed the DC power cable and the radio speaker cable. Feed the A210 wires inside the enclosure. Attach the A210 to the top of the Hammond enclosure. I used Coax-Seal putty. Use something that can be easily removed. Velcro is also fine. Remember that the Bluetooth pairing pin-hole is located on the bottom cover of the A210! Install the interface PCB. Bring all the wiring underneath the PCB and above it by routing it to one of the open corners in the Hammond enclosure. Solder the wires and cables to the proper locations. Follow the wiring diagram shown to the right. If you do it right, you should be able to take the PCB out of the enclosure when all the wiring is still attached.The result should look similar to my assembly shown below. Install the proper connectors for the radio interface. Follow your radio manufacturer's wiring instructions or the radio schematic diagrams for the microphone connector pinout. Make sure that everything visually checks OK. Do not connect the cables to the radio yet. Apply power to the unit. Repeatedly press the PTT push-button. The PTT LED should alternate between on and off states. Press on the A210 power button until its blue LED flashes a few time. From that point on the A210 LED should flash once every few seconds. Now is the time to pair up the A210 and your headset. Using a needle-sized object, press the pairing button in the hole under the A210 casing. The blue LED should become solid lit. Now put your headset in pairing mode. This is usually done by pressing the headset push-button for about 10 seconds, but follow the headset instruction manual. The pairing should be completed in about 20 seconds. This will be the case when the A210 LED returns to a single flash every few seconds. Now turn off both the headset and the A210. At this point, connect the radio speaker and the microphone connector. Go to an unused frequency on your transceiver. If the SSB mode is available, select it. This will reduce the RF interference you produce when the PTT is engaged. Now turn the A210 back on. Then turn on the headset. The radio should transition to Transmit mode and the PTT LED will turn on. This is normal and inherent to the Jabra A210 push-button operation. Release the PTT by either pressing the headset push-button once or pressing the wired PTT push-button on the Hammond enclosure. As far as audio adjustments go, listen to an occupied frequency and increase the speaker volume on the radio. You should hear the radio speaker audio into the headset earpiece. For transmit audio, you need to monitor yourself into another receiver or ask someone to help you. There is a 3-position microphone slide switch on the A210. Select the switch position for best transmitted audio. There is a one-second delay between depressing the headset push-button and the radio PTT action occurring. This delay is generated by the A210 and there is nothing that can be done to reduce it. In a typical simplex or repeater conversation, this is not much of a problem, but forget about contesting using the headset push-button! If you need fast PTT action, just use the wired PTT push-button instead. Note that the headset microphone audio is always present at the radio connector. I have verified that the range is around 10m (30 feet) in line of sight. Walls and floors will reduce the range though. So I would not claim that you can walk around everywhere inside the house and expect it to work flawlessly. But "inside and around the shack" is probably a better way to describe the range. I have noticed that there may be a low-level constant-pitch whining noise present on the transmit audio. The intensity of that noise seems to be dependent on the headset type used. It is quite low, certainly not enough to annoy the people listening to you, but it may show up. Once you know these things, you can enjoy using your bluetooth headset on any amateur radio transceiver like I do in the car. I actually like it even better inside and around the shack. I can walk around and still provide input on our local VHF SSB weekly net without having to run to the radio every time they turn it over to me. Very convenient! 1N4148 or 1N914 silicon diode, or equivalent silicon diode. Microchip PIC12F683 micro-controller, DIP package, programmed part. PCB, single-sided copper clad glass-epoxy material of 0.062" thickness.